In my day job, we have several employees who use sign language as their primary means of communication. I used to work in Human Resources and spent much of my time helping employees deal with their benefits, with the myriad of information that came from corporate offices, and just figuring out day-to-day messages. So, when my boss at the time said they’d be offering sign language classes, I was happy to sign up. I thought it would help me do my job better, as well as help my co-workers. I never thought about how it would change my thinking and be the impetus for one of my favorite books. The teacher who showed up that first day, was hearing impaired herself. She informed us--through writing on the board and another of my coworkers who knew sign--that we would not be speaking in the class. The looks on everyone’s faces when we figured that out was quite interesting. I have to admit I was a bit uncomfortable—how the heck would I learn without asking questions? Then it dawned on me--that’s probably how a hearing impaired person must feel walking into a room full of people who don’t know sign. It was very eye opening. And it didn’t take long before my writer’s brain clicked in and started asking dozens of “what if?” questions. Each class, I found it easier to understand the signs, and sometimes easier to make them. Both are difficult, by the way. My fingers are not as cooperative as I’d like and looking at the signs, in reverse, is definitely a puzzle sometimes. Watching someone sign at full speed, as quickly as I would speak, is daunting to say the least. One of the first signs I got down pat was “slow” both to ask someone to sign slower and to explain my bumbling. As I learned, I came up with the story of Lauren Ramsey and Jason Hawkins. It was a story that intrigued and scared me. I want to write stories that are realistic and honest. I wasn’t sure I’d be able to portray someone whose life I couldn’t fully understand. But I wanted to write it. And my characters seemed to want their story told. They wouldn’t fade away like some story ideas I’ve come up with. They just kept getting stronger in my mind. So, I talked to my editor and she encouraged me to go for it. And so I did. But it wasn’t easy. I struggled to get the words on the page. I was late meeting my deadline, which really bothered me, mainly because so much of what I was writing stumped and challenged me. But then I realized something. I was focusing on the differences in our lives, not on the common ground. And there is a common ground. We all feel, we all have daily concerns, fears and dreams. Once I figured that out, it helped the story come together, and—oddly enough—made it easier to communicate using sign. I stopped worry and just did it. That story became THE BALLERINA’S STAND, which is a July Super Romance release. It’s a book I’m proud of, but very glad it’s finished. I’m not taking sign language classes any longer, though I keep practicing. I even find myself signing absently sometimes. It’s nice to realize I’ve learned something, from my class, from my teacher and even from myself. Hopefully, readers of THE BALLERINA’S STAND will come away with something as well. 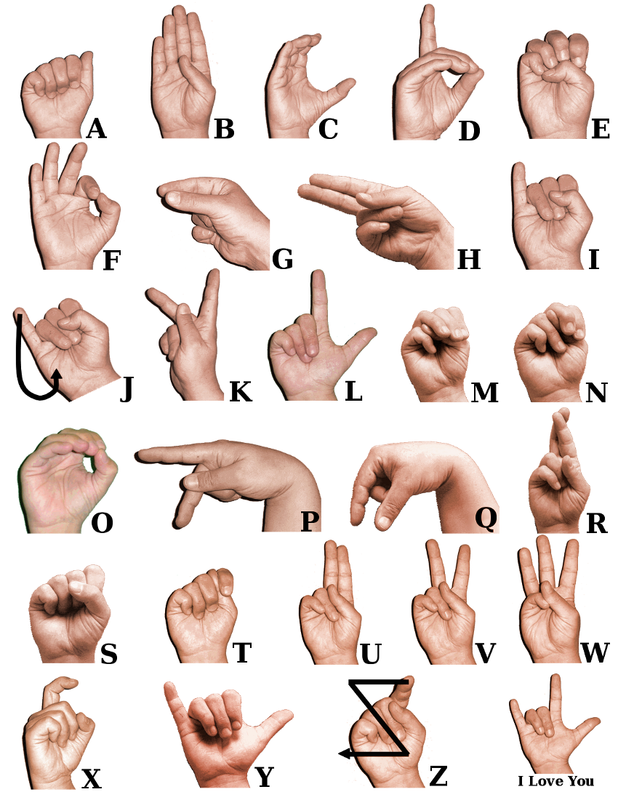 If you’re curious, please consider checking out the Sign Language info that’s available in books and online. It’s an easy alphabet to master, and the foundation of learning a whole new, fascinating language. Who knows who you’ll meet—maybe someone who’s actually a character in your favorite book! I know many writers who find inspiration in real people, but I wonder if readers like to hear that there’s a real life tale behind a story. I’d love to hear what everyone, readers and writers alike, think. I can sign. My son has a profound hearing loss, so the whole family signs. I can yell without making a sound. It's a gift. Great post, Angel. I have had to learn some sign in my day job, working as a classroom assistant with special-education students. It was so cool picking up one sign at a time while encouraging students to add to their verbal vocabulary the same way. We learned together. Can't wait to read your new book! we learned some limited sign when bebe was an infant (baby sign is AWESOME! ), and it's funny to see her still using some of the signs from time to time (she's now 8). Can't wait to read your book! What fun experiences! Thanks everyone for sharing.